That is how it was when my first Persian rescue came to call. 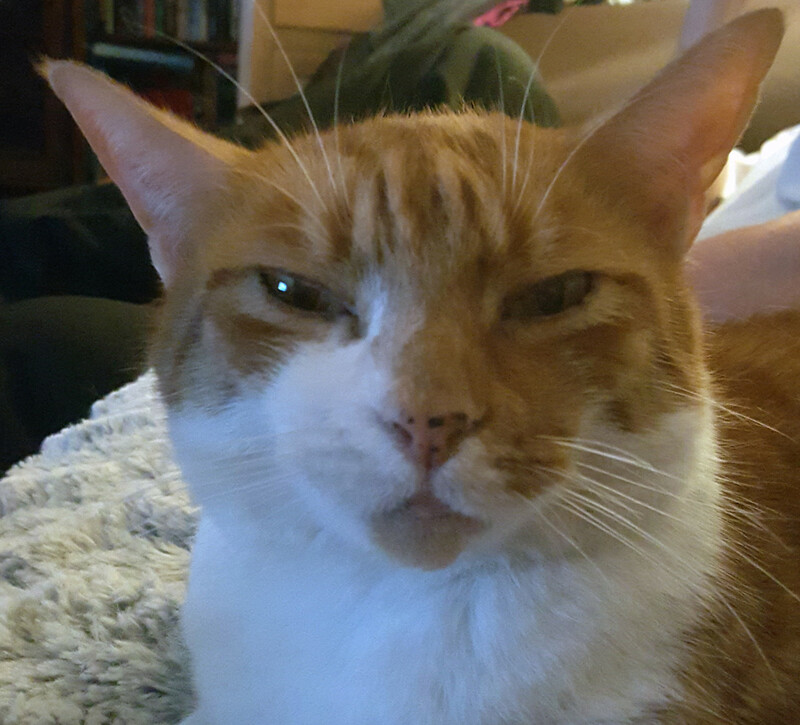 We had sworn off animals, wanting to travel, but within days of moving into our home we had been adopted by a black cat, then a marmalade cat who ate all our goldfish but was quickly forgiven. Travel was still possible, they were happy with Auntie Chris at the cattery and then Tahsy appeared. She was a dramatically coloured "subdued tortoiseshell" although the vet called her "grey". A beautiful creature, she prowled around our garden for days, appearing at the window, calling to us and staring in with those big orange eyes of hers. Well, we called her Tahsy for short, but Photahsiamirabel was the name we gave her when we took her in. It is the name I write under to this day! It became obvious that she wasn't going away, her calls became more insistent as time passed and she ate the scraps our neighbour put out for the birds. That rang alarm bells. We put out regular cat food and she quickly demolished it. We put out kibble and she came back for more. Quietly I approached to stroke her and discovered that underneath that thick coat lay nothing but skin and bones. She was obviously ill, lost or abandoned and I felt no option but to take her in. We did try to find out her home, we advertised, we asked the vet, we enquired door to door, but nobody had lost a Persian cat so it seems. It was obvious to us that she was a pedigree, her face had the ultra nose. 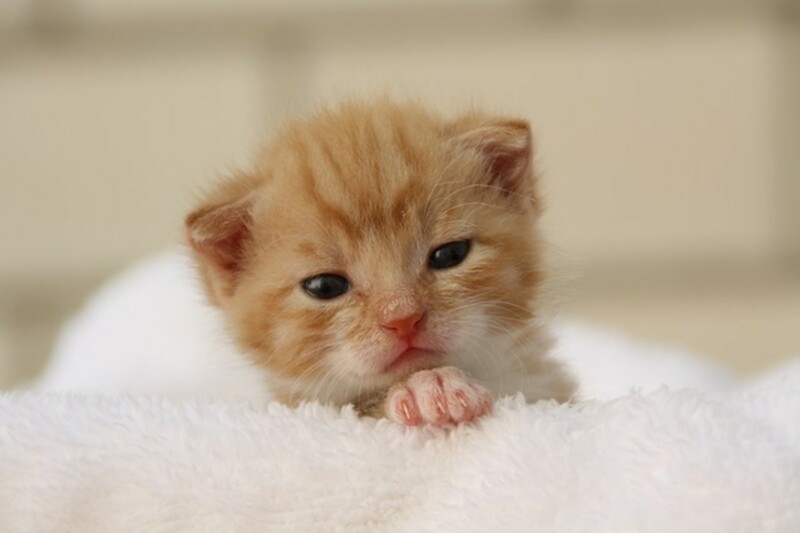 How could a cat like this - who was little more than a kitten - be abandoned or lost? That first night I combed her for fleas - she was totally infested. The following night I found ticks on her neck - that was what brought us to the vet. He removed the ticks safely, treated her for fleas and worms and informed us she might have died in a few days from malnutrition, anaemia and the cold had we not taken her in. The tinned cat food disagreed and gave her wind - her name, Photahsiamirabel, came from f@rt @rse (@ standing for the letter a of course). She was put on a recommended diet of Iams and the problem ceased. She became The Empress and inspired poetry and art, but most of all she was our kitten, she slept on the bed, burrowed under the covers and totally ruled our lives until the day she died after a long battle with mammary cancer. 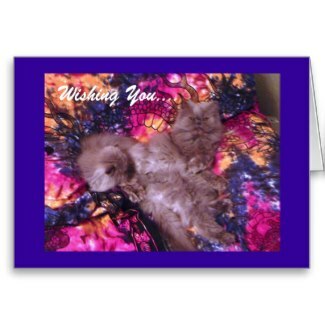 I promised her as she lay dying that I would help other Persian Cats and I have done my best to keep that promise. Alright, we've all see the Disney take on the Persian Personality - feline gang boss, aloof, vain, self-seeking, always plotting.... None of the above apply in my long experience of serving Persian cats. And what about Dr Evil of course? Just look at my boy plotting destruction from the safety of a microphone box on the bed. That face is the very embodiment of innocence! 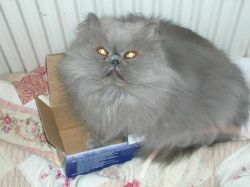 Persians are rarely aggressive, they can be far too trusting of humans. An outdoor Persian cat is a disaster waiting to happen. Their territorial sense is not as pronounced as other cats and if allowed to wander they can easily become lost, or even stolen - worst of all, stolen for their fur! They can be very intelligent and yet they have little road sense. The interbreeding used to produce small noses, big eyes and beautiful coats over the decades has led to breathing problems, kittening problems and means they need a specialised diet. 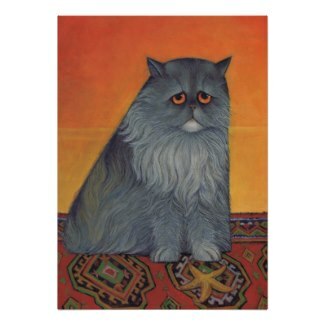 Persian tummies can be easily upset by normal cat food, food sensitivity or too many treats. When they shed, they truly shed! 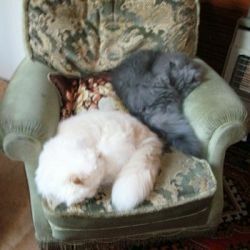 It is possible to have a well groomed Persian with a glorious coat one week and the next week, despite proper grooming, they have mats in a thinning coat. 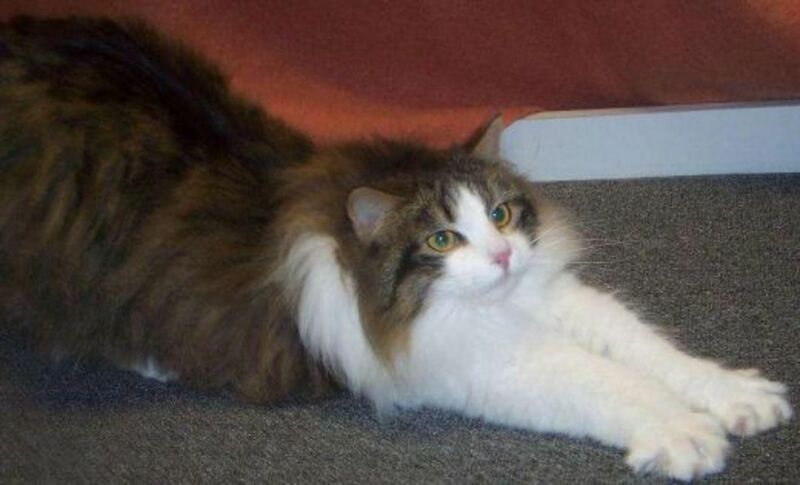 Combing needs to be part of a daily routine - some Persians love it, most do not and object to having legs and tummies groomed in particular. Most Persians are friendly and gregarious. They rarely fight with each other and sometimes like to snuggle up together - there are exceptions to any rule though - Amberleigh being one! 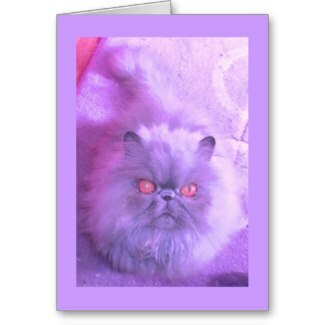 I have already mentioned about sensitive tummies and breathing difficulties, but the inbreeding undertaken even by reputable persian cat breeders to get that variety of color and still keep the breed standard sometimes results in tragedy. My beautiful Himmie would wake me each morning by climbing on my chest and purring and licking my face until I got up to play with her. It became possible to adopt her sister too. They made a beautiful and loving pair as you can see, but the reunion was to be shortlived. Rescue is not a cheap option! 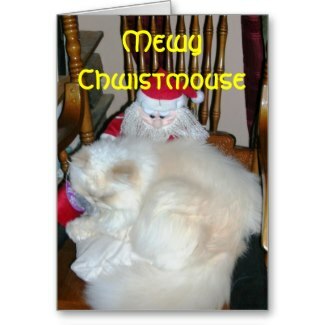 When you adopt a rescue persian, expect to pay a rehoming fee. It may cost as much as buying a kitten. Expect to answer LOTS of questions about your home circumstances and what you might do if the cat has behavioural problems. 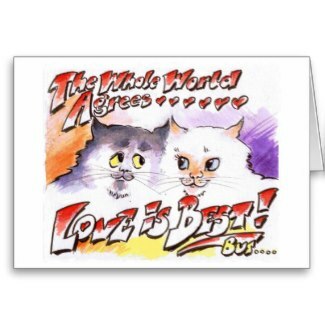 A reputable rescue want to discourage adoption on a whim and will have big costs! A little guide for cat lovers and those difficult toilet problems. I hope you have learned a little about the Persian Personality here. Thank you for visiting. 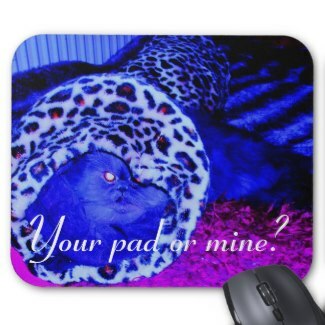 Are you owned by a Persian Cat? - Do you understand the Persian Personality? I love Persians too. We had a couple when I was growing up. Thanks for sharing your stories. Just read about your cats,I have always had one however ,Persians were new to me.I helped my daughter by being a foster mom. I was hooked. 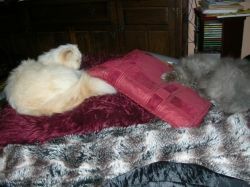 love my little persians, they are a lot of work but worth it. They are my baby's . I agree with all you have said about the breed,they are wonderful. I found your lens interesting and distressing. We often do not engage brain befpre we do. Breeders should have to consider the health risks to the animal of what they do. Thank you very much mate, for your lens exelentes! The pictures were great and the poem was a nice touch. Lovely lens about lovely cats. I have a pug dog who rules my house, but would love to have a cat too. Thanks for sharing your story. Blessed by a SquidAngel. I've always been keen on owning a Persian kitty. I don't think Marigold would appreciate a new "friend" taking over her house though! 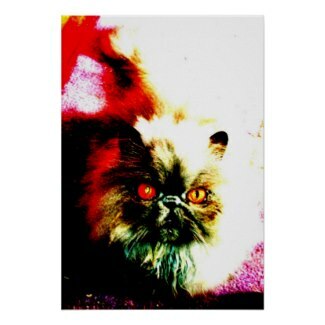 I am owned by two purebred persian cats :-D Although not rescued, rather purchased from reputable breeders.